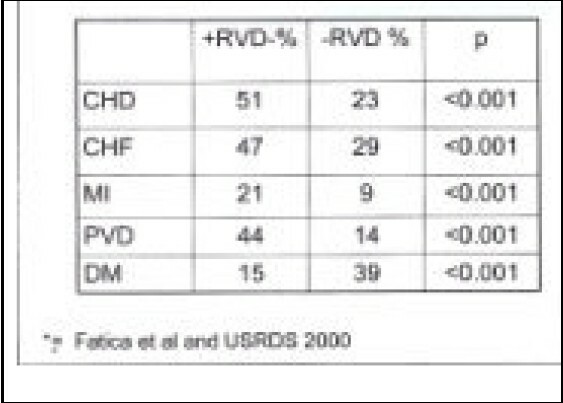 Renal clearances of suitable clearance markers such as inulin and p-aminohippurate, determined before and after protein load, have been used for a long time to determine glomerular filtration rate (GFR), renal blood-flow, renal functional reserve as well as renal vascular resistance. Despite this long history, inconsistent results were achieved in determining renal functional reserve after protein ingestion or aminoacids infusion. Most authors found acute 'blunted increases' in GFR after dietary stresses, whereas others found acute decreases. In hypertensive patients showing hyperfiltration, a contradictory situation was observed; the traditionally observed 'blunted increase' in GFR and increase in the intraglomerular pressure were neither accompanied by a change in albumin excretion nor by an expected dynamic GFR response after administration of angiotensin converting enzyme (ACE)-inhibitors. We are of the opinion that the traditional clinical methods for assessing acutely provoked changes in renal function have been inappropriate and that an approach based on the two-compartment model of pharmacokinetics is more adequate for studying dynamic clearance changes within clinically feasible time horizons. 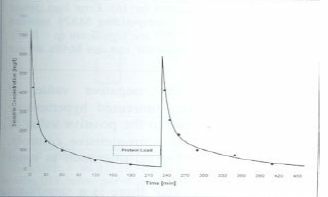 Such test evaluations performed in patients within a washout period, and after long-term treatment with various drugs enable one to assess the efficacy of the therapeutic regimens especially in patients showing apparently normal or increased baseline clearances in hyper filtering kidneys. Many patients with proteinuric chronic nephropathies progress relentlessly to end-stage renal failure (ESRF). Research in animal and human models has helped to identify the mechanisms involved in this progression and to indicate effective intervention. We review the main factors associated with the progression of chronic renal diseases including systemic and intra-glomerular hypertension, glomerular hypertrophy, proteinuria, hyperlipidemia, and intrarenal precipitation of calcium phosphate. We also describe a therapeutic strategy aimed at achieving maximal reno-protection. Diabetes is the disorder most often linked with development of end-stage renal disease (ESRD) in the USA, Europe, South America, Japan, India, and Africa. Kidney disease is as likely to develop in long-duration non-insulin dependent diabetes (type 2) as in insulin-dependent diabetes mellitus (type 1). Nephropathy in diabetes, if sub-optimally managed, follows a predictable course starting with microalbuminuria through proteinuria, azotemia and culminating in ESRD. The rate of renal functional decline in diabetic nephropathy is slowed by normalization of hypertensive blood pressure, establishment of euglycemia, and a reduced dietary protein intake. 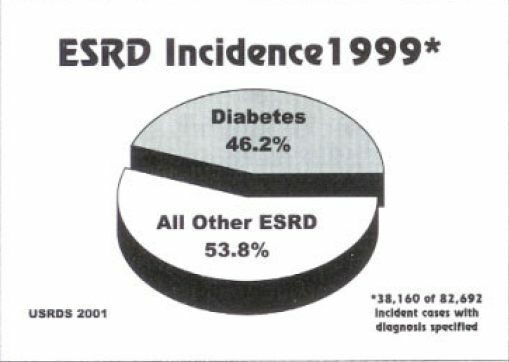 When compared with other causes of ESRD, the diabetic patient sustains greater mortality and morbidity due to associated systemic disorders especially coronary artery and cerebrovascular disease. A functioning kidney transplant provides the uremic diabetic patient better survival with superior rehabilitation than does either continuous ambulatory peritoneal dialysis (CAPD) or maintenance hemodialysis. There are no reports, however, of prospective controlled studies of dialysis versus kidney transplantation in diabetic patients whose therapy was assigned randomly. Survival in treating ESRD of diabetes is continuously improving. This progress reflects multiple small advances in understanding of the pathogenesis of extrarenal micro- and microvasculopathy coupled with safer immunosuppression. Combined pancreas and kidney transplantation has so far been performed for a minority (<10%) of diabetic ESRD patients and has offered cure of the diabetes and full rehabilitation. No matter which ESRD therapy has been elected, optimal rehabilitation in diabetic ESRD patients requires that effort be devoted to recognition and management of co-morbid conditions. Anemia is common in renal failure in both predialysis and in patients maintained on dialysis. 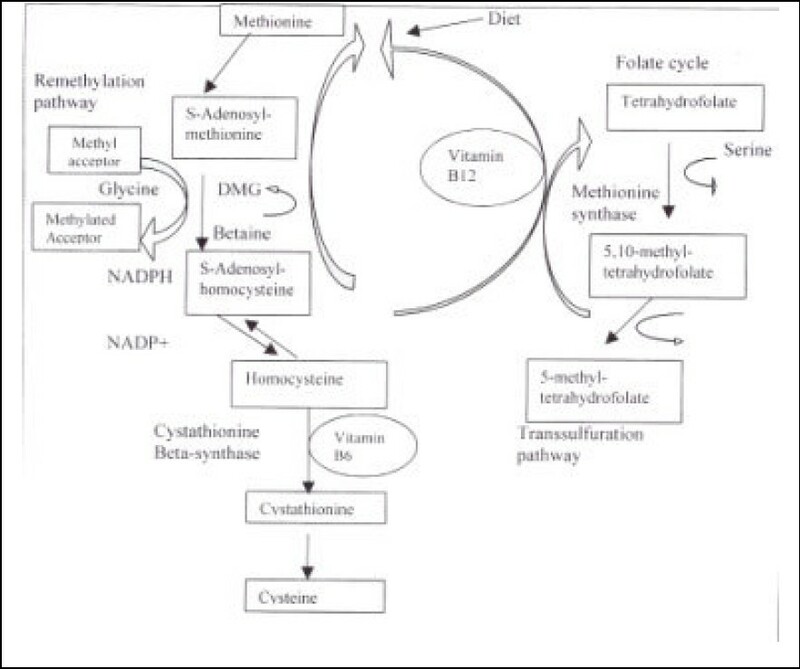 Consequences of anemia include decreased cognitive function, decreased exercise tolerance and a feeling of inadequate well being as well as increased left ventricular hypertrophy and dilatation that result in increased cardiovascular morbidity and mortality. Iron deficiency is the most common factor for erythropoietin resistance even in predialysis patients. This article reviews the factors involved in anemia in predialysis patients, management issues and current recommendations. To describe current knowledge on the etiology, pathology, diagnosis and treatment of HIV-associated nephropathy (HIVAN), a Medline search was performed from 1989 to March 2002 using the key words, "HIV", "nephropathy", "renal" and "kidney". A further search was performed for each of the currently licensed anti-retroviral agents linked to key words "renal" or "kidney" and also using the MeSH heading "pharmacokinetics". Following the introduction of highly active anti-retroviral therapy with subsequent immune reconstitution different patterns of renal disease have occurred. In patients suffering from HIV-infection, the most common cause of renal failure is HIVAN. This rapidly progressing renal failure is the commonest complication of HIV in black African and Afro-Caribbean patients. 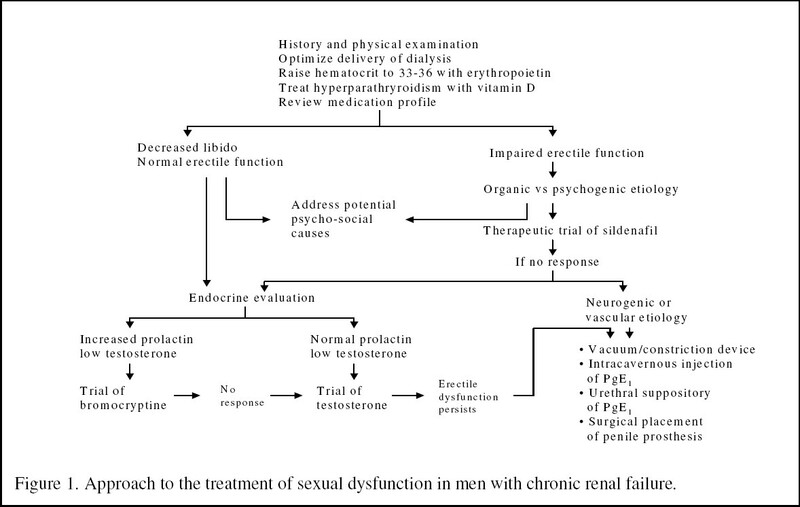 Fortunately, if patients are diagnosed and treated soon enough with highly active anti-retroviral therapy, the evidence suggests that full recovery of renal function is possible. In conclusion, since HIVAN is a treatable condition, it should be actively sought in HIV­infected patients if they are to receive the benefits of therapy. A specially designed questionnaire was used to explore the predominant trends of pre-end stage renal failure in Egypt. A random sample of 47 physicians dealing with such patients was chosen to fill the questionnaire during a recent scientific gathering. 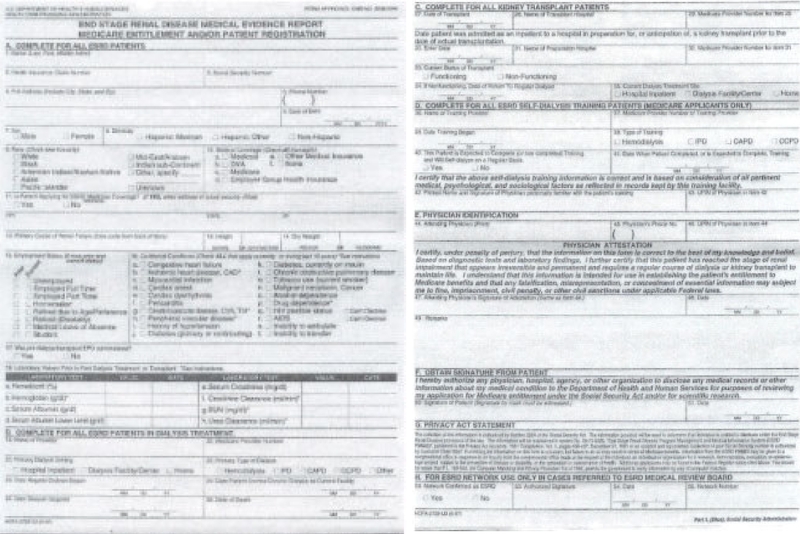 They were of different ages, qualifications, years of experience and health-care disciplines. Collected data were entered into a computer database and subjected to statistical analysis and correlation with relevant physicians backgrounds. The study shows that the Egyptian trends are generally conforming to respective international recommendations; major deviations being largely the result of economical shortcomings. There was no significant impact of physician-related factors on patient management trends. The objective of this study was to evaluate the effect of the management of factors accelerating renal injury such as hypertension and diabetes on progression of chronic renal failure (CRF). For this end, the records of 112 CRF patients with serum creatinine (SCr) level of 150- 850 µmol/L were retrospectively studied at King Khaled University Hospital in Riyadh, Saudi Arabia. The leading causes of CRF in the study patients were diabetes in 52 (46.4%) patients, glomerulonephritis in 25 (22.4%) and hypertension in 17 (15.2%). Progressive elevation of SCr level was recorded at 92 µmol/L/year in 62 (55.4%) patients with initial SCr level of 150-300 µmol/L; they progressed to end stage renal disease (ESRD) in a mean duration of 4 ½ years. Forty-three (38.4%) patients with SCr level of 300-450 µmol/L had an increase of SCr at 136 µmol/L/year and progressed to ESRD in a mean period of four years. Seven (6.2%) patients who had initial SCr level of > 450 µmol/L had an increase of 136 µmol/L/year and progressed to ESRD in a mean duration of 2 ½ years. 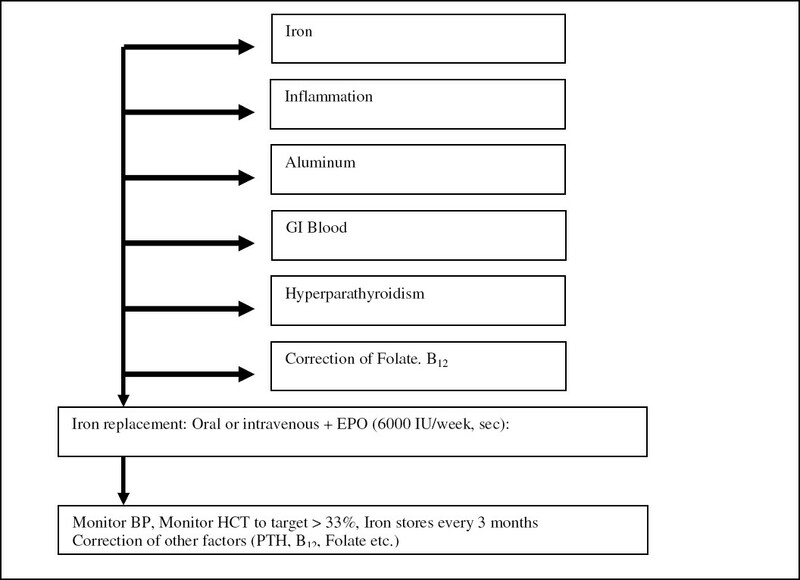 Sixty-two (55.4%) patients had initial blood pressure (BP) readings above the recommended level of 130/80 mm Hg. Antihypertensive management stabilized 47 (75.8%) of these patients using multiple drug regimens such as an angiotensin converting enzyme (ACE) inhibitor and diuretics (20.5%). Though this center did not use erythropoietin (EPO) in these patients, the control of the levels of hemoglobin and hematocrit was obtained by aggressive iron supplementation including intravenous administration. In conclusion, the present management of CRF patients, which attempts to comply with the international standards, still needs refining in order to reach better outcome. A retrospective review of data of pre-end stage renal disease patients being followed-up at the Jeddah Kidney Center, Jeddah, Saudi Arabia was performed. A total of 99 patients fulfilled the inclusion criteria. There were 58 males (58.6%) and 87 were Saudis (87.9%). The mean age of the patients was 49.5 years (11-90 years). Diabetes was the commonest cause (29.2%) followed by unknown etiology in 20.2%. Hypertension was a predominant co-morbid factor seen in 83.8% of the patients. Optimal control of blood pressure was achieved in 30% of the patients, an area where improvement is required. The mean serum creatinine at first visit to nephrology service of 300 µmol/l reflects delayed referral from other services. The levels of calcium, phosphate, cholesterol, albumin and hemoglobin were satisfactory. Our study suggests that more efforts are needed to promote early referral of patients with chronic renal failure to nephrology care. Also, greater emphasis is needed towards achieving rigid blood pressure control. The quality of care of patients with advanced chronic renal failure (CRF) is known to have a significant impact on the mortality of dialysis patients. We evaluated 22 patients with pre-end stage renal disease (pre-ESRD). Different parameters and factors known to affect the mortality in dialysis patients were studied. Diabetes mellitus was the leading cause of CRF found in 50% of local patients. Hypertension was the major co­morbid condition associated with CRF, noticed in 73% of patients. At the time of referral, the mean serum creatinine was 303.14 ± 144 µmol/l, and hemoglobin was 107 g/l with 41% of the patients receiving erythropoietin. Hypo-albuminemia was frequently noted with most of the patients having serum albumin level of 30 ± 6 g/l. A total of 36% of the patients had a functioning permanent vascular access. Hepatitis B and C were each seen in 6% of the patients. Two patients (9%) underwent pre-emotive renal transplantation. Our study suggests that more effort is needed to optimize the care of patients with CRF, mainly the nutritional status. Education of general internists, nephrologists and patients, for early referral, optimal care and better compliance, will have an important impact on the care of pre-ESRD patients.